My second installation at the William Foy Cell, Redhouse Cymru, Merthyr Tydfil. November 2014 to May 2015. The Ladies and Gentlemen of Merthyr society, misogynistic, mean-spirited, murderers and deviants all are in a cell awaiting Judgment. The Merthyr Iron Master Robert Crawshay's tomb bears the legend 'God Forgive Me'. For those in the cell laden with guilt, He could well be the only one that will. 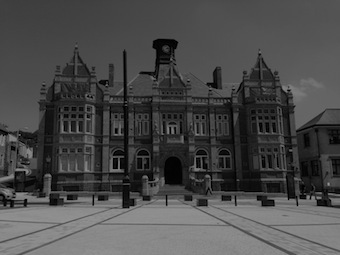 The name of Redhouse Cymru invokes the red flag of social justice first raised at Merthyr. It is fitting then to put the great and good under lock and key here. 'God Forgive Us' is my second installation in the William Foy Cell this year and includes 12 paintings, 6 of which are previously unseen. The Victorian holding cell from 1896 is the perfect setting for these works. Open Monday to Saturday 8:30am - 5:00pm. The brilliant soundscape in the cell was written by Tom Ware- https://soundcloud.com/tomware.